Occasionally my band releases some music. Sometimes (but not always) I post about it on this blog. I'm particularly happy about this latest effort, so I wanted to make a point of posting about it here as well. "Vile Christmas" is now available for purchase and download at CDBaby. Over the years we haven't just recorded songs for albums -- we've also made recordings for our family and friends. Vile Christmas is a collection of some of these recordings. These songs were not recorded for radio play, but to amuse family and friends and to provide an interesting gift for the holidays. We hope that these recordings will amuse you too. We had a lot of fun making them. We hope you have just as much fun listening to them. Moving to a new web host? You don't have to transfer your domain name. Web hosting is a very organic business. Clients come and go all the time. Businesses come and go. Good ideas survive and less successful ones need to be abandoned. Sometimes a move to a new web host is urged on by your web designer. Maybe your designer is more comfortable with her regular web host or, as is quite often the case, your designer is getting a kickback for referring new business. You are now being told to move your site in order to put a few extra bucks in your web designer's pocket. Whatever the motivation, many designers will also tell you that you need to transfer your domain name when you make the move. Whatever decision you make, you should be aware that moving your hosting business to another provider is more easily done when you do not transfer your domain name. Domain name transfers can be complicated, can involve a lot of frustration and are often just not worth it. You may say that I have a bias here, because I offer both web hosting and domain name registration. For the record, let me just say that I like to make it clear to new clients that they don't have to transfer their domain registration to wundersolutions.com when they move the web site here. If you choose not to transfer the name, all that is involved is you logging in to your domain management tool and changing the nameservers. This is typically two text boxes which you have to fill in. Click the submit button and you're done. A transfer, on the other hand, involves a purchase of at least one additional year for your domain. It may require filling in an extensive form with the new domain name reseller, requiring an authentication code from your current registrar, waiting for a confirmation email and going to another page to confirm the transfer. Then, once the transfer is complete, you still have to log in to change the nameservers. It's a complicated and convoluted process. You don't do it often enough to remember the steps. So, next time you move, you'll probably not remember how you did it the first time and the fun begins anew. You should also keep in mind that many registrars make little to no money on domain name registrations. They're typically "loss leaders", or low priced items designed to attract your initial business so that you'll spend money on hosting, SSL certificates, email etc. My advice? If you're happy with your current registrar, don't bother transferring your domain name. If you're unhappy, by all means, find a new registrar. Just know that it's not a requirement, regardless of what you're told. Late in 2010, WorldPay gave me 60 days notice that they would be pulling out of the Canadian market and that I'd have to look elsewhere for credit card processing. The way they handled this could easily be covered in a series of blog posts. Let me just say that, after years of great service from WorldPay things have ended on a very unsatisfactory note for me. I won't be encouraging any more of my clients to go with WorldPay as a billing solution. There are better solutions out there and there are companies out there who will treat you with more respect. That's all I'll say about that for now. If you don't have a PayPal account, you won't be required to create one in order to make a single (manual) payment, so it won't be much different than making a payment to any other gateway. The difference is that PayPal will handle your credit card details (rather than the WunderCounter) and that's a good thing. Last week I released the "Hydro Smart" iPhone/iPod/iPad application. This app is targeted at people living in Ontario, Canada, who are on the "smart meter" system for hydro (electricity). 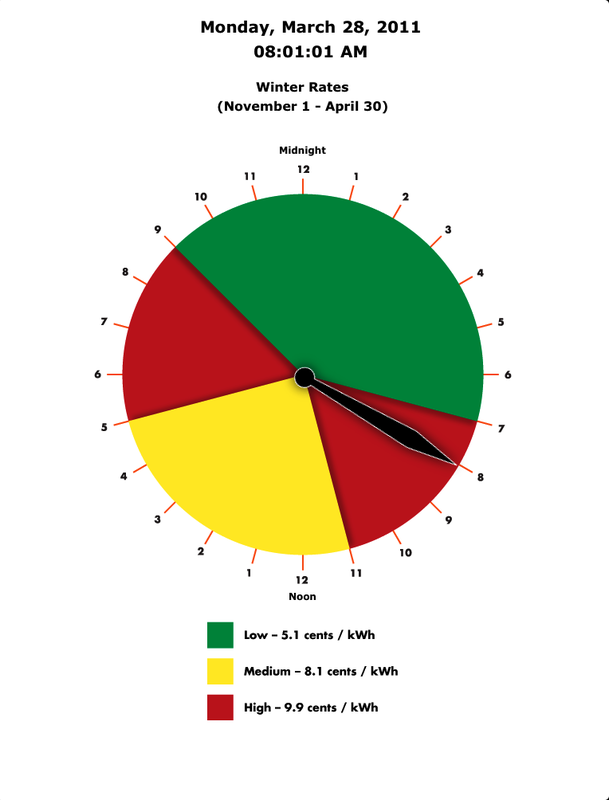 If you have a smart meter, you're subject to a quite complicated series of rates and times. If you run your appliances at the wrong time, you'll be billed significantly more for electricity usage. This application helps you to establish which rate you're being charged at any given time, so that you can make educated decisions about when to use more (or less) electricity. This app is currently available for just 99 cents, an amount you can quickly and easily recoup simply by following the rate charts. It's good for you and it's good for the environment. Ever since I started the WunderCounter, I've struggled with finding a pricing structure which is easy to understand and which is also fair to everyone who uses the site. One thing which I've tried to avoid, is making the billing anything like getting a cell phone plan. Any time I've dealt with mobile providers, I've always been confused about the different plans, how any one is better and what I'd actually be billed for at the end of the day. For this reason, the WunderCounter doesn't offer a lot of different plans. For the most part, I think it has been okay, but I'm not 100% happy with it. The main problem is that there are too many differences between the different account types. They all have different features, different amounts of data returned in reports and data on file for different lengths of time (2 days, 1 week, 6 months etc). It's difficult for new users to get an idea of which plan is best for them. On the server side, it's a hassle to have to enforce an elaborate permissions system to make sure that person X cannot access report Y. I don't think it needs to be that way. So, this is just a heads-up that I'm planning to move the WunderCounter from its current feature-based plan to a usage-based plan. The migration from your current account to the new account will be seamless. You will not see any downgrade in features. In every case it will mean you get the either the same features or additional features. This will also mean that you'll no longer be left wondering which reports you have access to, as it should be generally the same across the board for all accounts. There will still be a few differences between account types, but generally it will be based on usage. By usage, I mean how many hits/day your account will be able to track. The idea is that if you're using the WunderCounter for a personal site which gets maybe 500 hits/day, you won't be forced to pay as much as someone who is getting 5,000 hits/day. You'll still have the option of a larger account which can track more data if you need it to, but you will be given the more affordable option as well, without trading off on available reports etc. This means that if you use the WunderCounter more, you pay a bit more. If you use it less, you pay a bit less. Cool features get released to everyone at the same time and you can all give me your feedback at the same time. There's a lot of history behind this decision and I've given it a lot of thought. I may lay it out in more detail if I get the time, but this is just a heads-up to let you know to expect some (very good) changes going forward. As always, let me know what you think. I recently had someone ask me just how to go about tracking Twitter links, so I thought I'd summarize the different ways. There are, essentially two ways to use the WunderCounter to track Twitter links. Firstly, you can integrate the WunderCounter with your software and secondly, you can create the links using a link generator in your WunderCounter account. For more information on integrating the WunderCounter with software solutions, check out my posts on Automating your link tracking is easy with TweetDeck, Tweetie and Tweetings. If you use different software which allows you to specify a custom URL shortener, please let me know, so that I can post an article on that software as well. If you're unable to shorten links automatically with software or if, for example, you're posting directly from twitter.com, you can create links in just a couple of clicks. Once you have logged in to your WunderCounter account. Choose "Generate HTML" -> "URL Shortener". Enter the URL you want to link to on this page, click "get short URL" and your shortened URL will be presented to you. Just copy/paste this shortened link into your tweet and your tracking will begin.